It is impossible to be indifferent to Jonathan Aitken. Some admire the way in which he pulled himself together having been convicted and imprisoned for perjury in the High Court. Many others are less impressed and remain deeply sceptical. 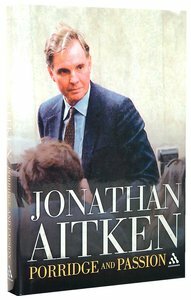 In his sequel to his first volume of autobiography Pride and Perjury Aitken starts his story as he is taken down from the courtroom and incarcerated at Her Majesty's Pleasure. He writes frankly of subsequent events. Visited by the ever-optimistic Lord Longford, Aitken emerged from the jaws of despair a chastened man. How this Old Etonian former Cabinet Minister on Mrs Thatcher's inner circle managed to establish new relationships and lasting friendships with fellow prisoners is fascinating - so too is this account of how religious belief transformed his life and began to influence the life of others. Emerging from Bellmarsh Prison one day with nothing but a black plastic sack of clothes. Aitken recounts how he was accepted at Wycliffe Hall Oxford to read theology and how this reconditioned his mind as well as his soul. Aitken has lost none of his charm, fluency, and determination. But now these are used for greater purposes. He has found a new life and meaning to it. The authenticity of this new life is something which drives him on, and which readers of this entertaining new book will be able to judge for themselves. JONATHAN AITKEN, an Oxford graduate in both law and theology, is the author of the award-winning biography "Nixon: A Life," A former British M.P. and cabinet member, his political career ended in 1999 when he served a seven-month prison term for perjury in a civil case. He is now a lecturer, author, columnist, and broadcaster.